Click Mag is the only magazine/blog theme you need to maximize clicks and keep visitors flooding back to your site. From its various social sharing options, trending posts, maximum ad exposure, SEO optimization, and attractive design, Click Mag will deliver the best user experience and clicks of any WordPress theme you’ve ever used! One-Click Demo Import – Quickly set up the theme like the demo with the One Click Demo Import plugin! Video/Audio Posts – Easily replace the standard featured image in posts with embedded video or audio from sites like YouTube, Vimeo, and SoundCloud. Retina Ready – The theme and its images look sharp and crisp on retina-ready devices! 800+ Google Fonts – Use any of the over 800 Google Fonts to set the fonts for the general text, navigation menu text, Featured Posts & Headlines, article title, and headings. Unlimited Ad Units – Click Mag takes full advantage of available ad space to give you a myriad of options to place your ads. The ad units include a main leaderboard area with adjustable height and width that can accommodate any size ad, a similar leaderboard ad unit displayed below each post, an Ad Widget that can accommodate 300px wide ads of any height in the sidebar as well as any size leaderboard ad in the homepage widget area. Click Mag also comes with dyanamic ad units within the homepage widgets that can accommodate 300px wide ads of any height. RTL Ready – With access to over 800+ Google fonts and a built-in RTL feature that lets you switch the stylesheet to RTL with the click of a button, it has never been easier to set your site to RTL. Unlimited Colors – Easily change the colors of the main background, navigation background/text, the primary theme color, and links to any color from within the Theme Options. 7 Custom Widgets – Click Mag gives you the flexibility and ease of use to display your content the way you want it without altering any code with our custom widgets. MVP Themes takes pride in its support! If you have any questions related to the setup of Click Mag that are not covered by the theme documentation or if you run into any bugs with the theme, please submit a ticket at the MVP Themes Support Center. 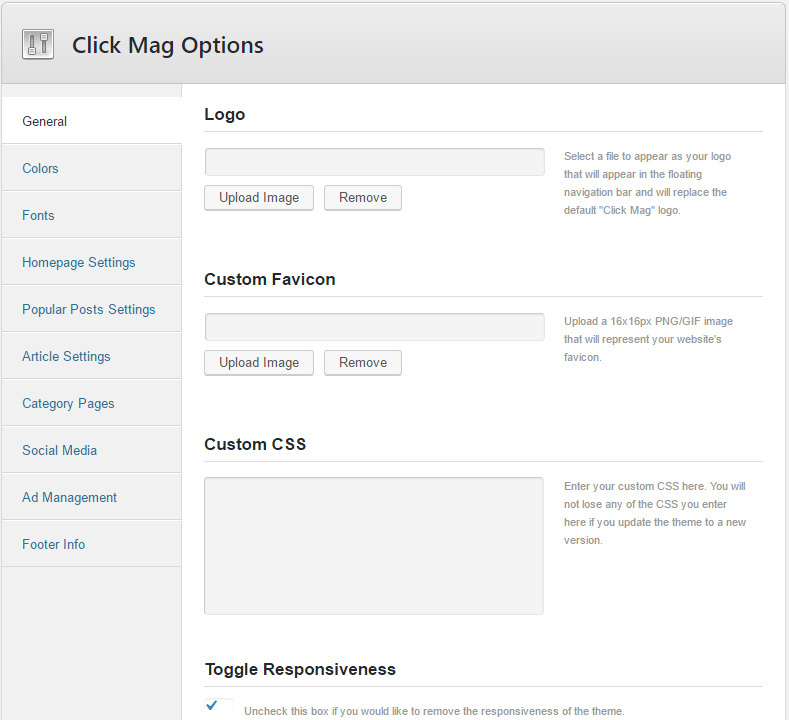 Unfortunately, MVP Themes cannot perform customization work for each of our customers, so Click Mag comes “as-is”. Any customization you would like to make to the theme outside of fixing bugs will need to be done by you or a third party.